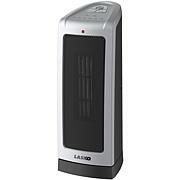 Lasko's 6435 Designer Series Oscillating Ceramic Heater with Remote Control provides warmth and charm to most rooms. Displaying a beautiful crackle finish, metal scrollwork base, unique hourglass shape, and neutral color, it blends well with any dcor. Not only elegant, its electronic touch-control operation with 2 quiet settings, adjustable thermostat, and energy-saving timer allows you to fine tune the room temperature to your comfort level. The oscillation function allows you to expand your comfort zone over a broad area. 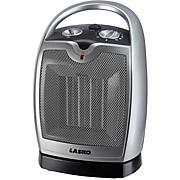 I was skeptical about purchasing this heater by some of the reviews. 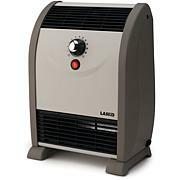 I received it and used it for a couple of days and the heat on 70 degrees warmed my entire living room which gets chilly in the winter time. I love the design. It can get too warm so I have to put it on the timer to control the heat. Would highly recommend. I bought this for my grandma that gets cold easy. She completely loves it!!! Says it heats up fast and with the timer makes it worry free. The looks also make it very easy to hide. I ordered one last year and it is working great. I ordered this one for the remote and it arrived and is doing a great job. It does produce a odor, but after sometime it goes away. 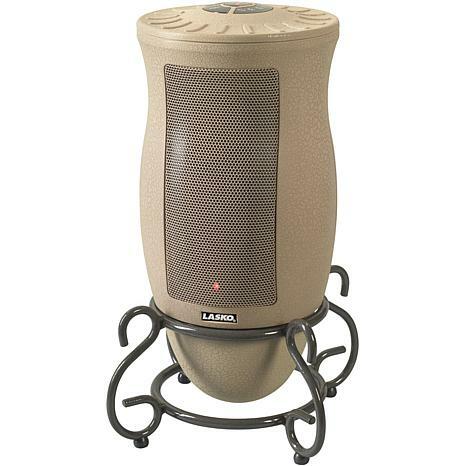 I have bought two of these heaters and they are quite and put out the heat. I am happy with my purchase, but the remote makes it more convenient. 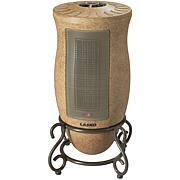 I got this heater last winter and love it!! It warms my whole TV room and doesn't look like an ugly space heater!! It's very petty to look at as well as very functional....very quiet, makes the room nice and cozy warm and kicks on and off to the desired temp without me having to worry!! Most people think it is a decorative piece, never dreaming its a heater!! I got this one with the remote due to I had just gone through a major back surgery but I highly recommend paying a tiny bit more for the remote!! It is fully functional and so nice when your finally nice and warm and comfy!! I am going to order another one for my bedroom!! It's awesome, especially with the Flex pay! Thanks HSN!! I love this heater. It not only looks beautiful, but does a great job at heating my bedroom. I wish I had ordered more! And probably will! A wonderful price for such a great heater.